Hehe. Mini Pumpkins. Don’t they just make you want to smile?! Cutest little foods ever! I can’t believe I’d never cooked with them until now…all the years I have been missing out on their cuteness! Here’s the deal, I currently have a cat sleeping across my arms, cause Snape (my little black cat that you probably see way too much of on Snapchat) likes to be touching me at all times. I have a cool cat, he is semi-annoying and WILL NOT stay off the counters while I am cooking. He acts like I don’t feed him and goes for things like butter, pumpkin puree and raw chicken (eewwwww). He’s also spilled my full cup of hot coffee multiple times now. Luckily only once did it spill on ME and luckily, it was almost gone. Why all the talk about my cat? Well for one, he’s the best, and totally becoming my best friend. You see, I never leave my kitchen and am constantly covered in flour and or chocolate and or grease (ahh the advantages of being covered in food). Plus, I have completely annoyed the heck out of my mother with too much “work talk” (cause I love what I do a little too much and too intensely). So Snape it is, he doesn’t like to leave my side, and while I am photographing recipes, he snuggles in the pile of linens that I have in the open drawer of my pantry table. When I am typing on the computer he’s on my lap or laying across my arms on the desk. Yep, we’re buds for sure! Anyway, the point of all this cat ramble was supposed to be that Snape is obsessed with these mini pumpkins. Well, more like very interested in them. A few weeks back my dad was down in Denver and picked me up around twenty-five of these little mini pumpkins. Ever since they made it into the kitchen, Snape can’t stop messing with them. He’ll roll them around with his paws, jump all over them and basically entertain himself for a good hour just messing around with the little mini pumpkins. He’s kind of a freak. But aren’t all cats??? But really, I get why he’s into them. For the millionth time today, they really are the cutest! Ok, and it helps that they are delicious when roasted. Especially when roasted and stuffed with wild rice. SOO, can you believe I made yet another super healthy dish for my Thanksgiving feast?!?! I think I am just trying to save all the butter for my mashers, and the cheese for my appetizers, and the sugar for my pies. They may be healthy, but I’m still totally into them, cause we’re talkin really good food here. 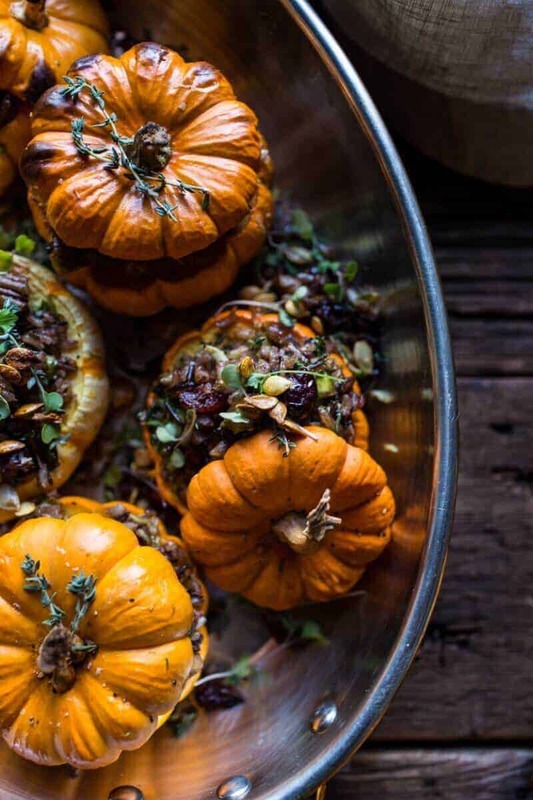 These Stuffed Mini Pumpkins are my favorite! Aside from good old white rice, wild rice is one of my favorite grains. I love its nutty and earthy flavors + textures. 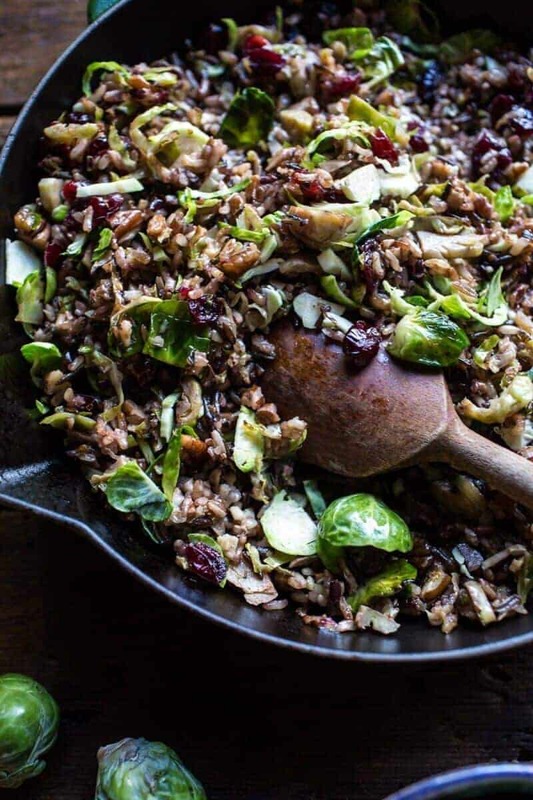 I ramped up the nuttiness in this mix with some pecans and also added some shredded brussels sprouts, dried cranberries and OK, just maybe a little manchego cheese, because really, you gotta have just a little cheese! This is such a simple dish to make, but full of so much flavor. It was a huge hit with everyone…well, everyone in our family who eats orange things like pumpkin. So basically me. Dad. And maybe mom. Actually, mom was into these because wild rice is her thing. Really any carb is her thing, and she’d be the first to tell you that. This is a such a fun side dish for the Thanksgiving table. You can even make it into more of a main for your vegetarian OR vegan guests (just omit the cheese for vegan eaters). AND, they also double as a centerpiece too. Obviously you want to serve these warm and all, but they look pretty dang nice on a Thanksgiving dinner table. Just saying. Double and… you can make this whole dish a few days in advance and then just throw the dish in the oven before dinner. Making your life like SO much easier come Thanksgiving Day, or whatever day it is that you plan on serving these. Finally, did I mention how healthy these are?!? Healthy and delicious. Cool! Cutest little foods ever! I can't believe I'd never cooked with them until now...all the years I have been missing out on their cuteness! Almost too cute to eat…but not really. Wow! Thank you so much, Scarlett!! OH! Those sound amazing though, but yes, these are easy!! Thanks Heather!! I love this recipe! And great pictures! I secretly read your blog at work (in the Netherlands) every morning so it’s time I said ‘hi’ and ‘I love your site’! These kinds of recipes where you embrace all of the colorful fall and winter vegetables are my absolute favorites! Awww, I loved visiting the Netherlands! It’s funny to think I read Tieghan’s blog here in Niagara Falls at work and you read her blog in the Netherlands. Small world =) Love these stuffed pumpkins, they just brought a smile to my face today and somehow made me happy. Need to make these for the Veterans in my life. Thank you Veterans, LOVE you!!! Thank you so much, Laura!!! 🙂 Happy Veterans day! Awe!! Wow, thank you so much!! So happy to have you as a reader!! HI Patricia!! Yes, that will be delicious! And now you’ve killed me with these baby pumpkins. And the sprouts, I so love brussel sprouts! And the images, they make me drool all over my laptop. Thank you! Oh I hope you get them too! Thanks Lynne! Your blog is my absolute favorite! Thank you for all you do! For the little pumpkins – what about the lid? On, off, on the side…? Thanks. Lori! wow, thank you so much!! Keep them off, but roast them on the side so that they get cooked. make sense? Thanks again! Wow looks great. Hey I’ve got a request from my 19 year old son to make an old fashioned legit Chritmas fruit cake, got any recipes? Thanks! OH BOY. Honestly, fruit cake is so not my thing, so I don’t have any recipes for you. Maybe try googling it? Sorry I could not help! I really like using Brussels sprouts now. All the years I missed not eating them. I know, right?! I did the same! Thank you! But eat ummm, they are delicious!! WHAT?!? I did not KNOW those mini pumpkins were edible!!!! OMG! These are the cutest yet most gorgeous things EVER! Yep…I’m definitely making these! Now I’m eyeing up the bowlful I have as decorations on my foyer table a little differently…lol! These are too adorable!! 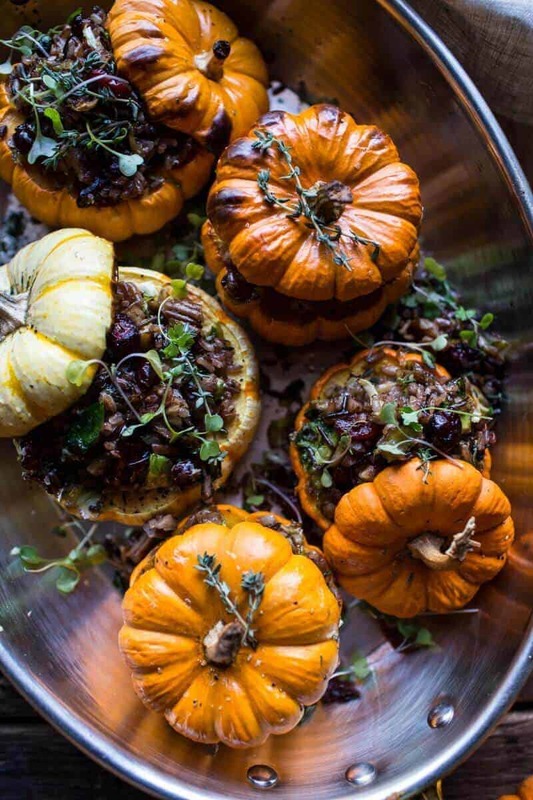 My mom makes a sage sausage stew in mini pumpkins every fall and they’re so great for entertaining! I am definitely adding this to my menu for Thanksgiving..so creative! I love Manchego too..in my top 5 fave cheeses for sure. This dish, as ALL of yours are, looks divine! 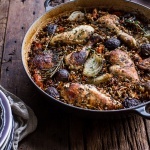 Every day I look forward to your post not only for the recipe but also for your gorgeous photos and comments about your daily life. I have been remiss in not complementing you on the lovely article in Colorado Homes; it was fantastic ! Regarding Snape, his interest in pumpkin may bode very well for you both. Raw pumpkin can be a huge health benefit for cats—great source of Vitamin A, antioxidants, and fiber to help keep those hair balls at bay. I have two cats and their daily treat is a tablespoon of raw (canned) pumpkin. They LOVE it! I believe Snape has a very good home! LOVE these stuffed pumpkins!!! 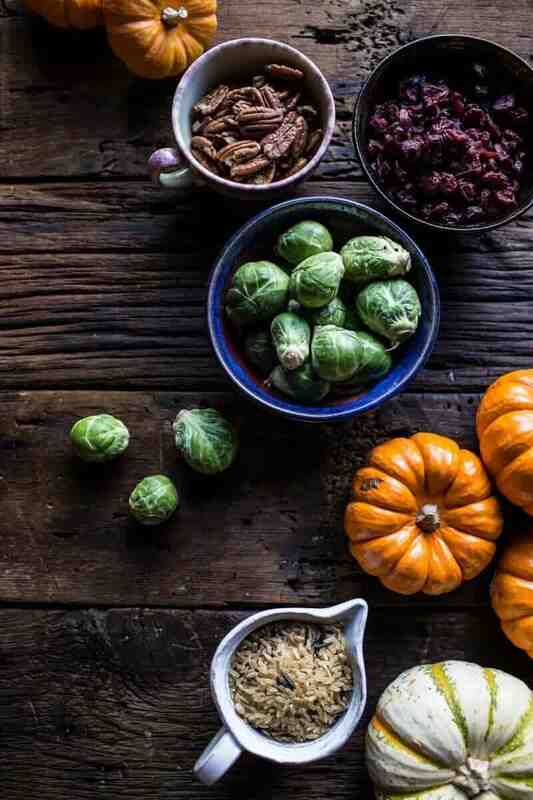 Will really make a Thanksgiving spread festive!!! Making!! Thank you! And yes, they do! I’d love to hang out with you someday Tieghan and eat all of the food you make..another bang up recipe!! 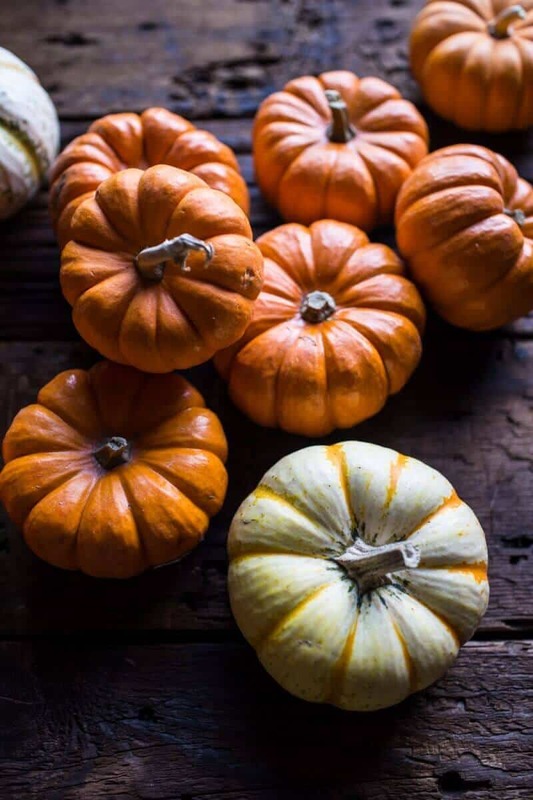 These mini pumpkins would look adorable any Thanksgiving table! You are not alone – I am obsessed with my cat too, and proudly call myself a crazy cat lady. No shame about it! They are awesome companions. 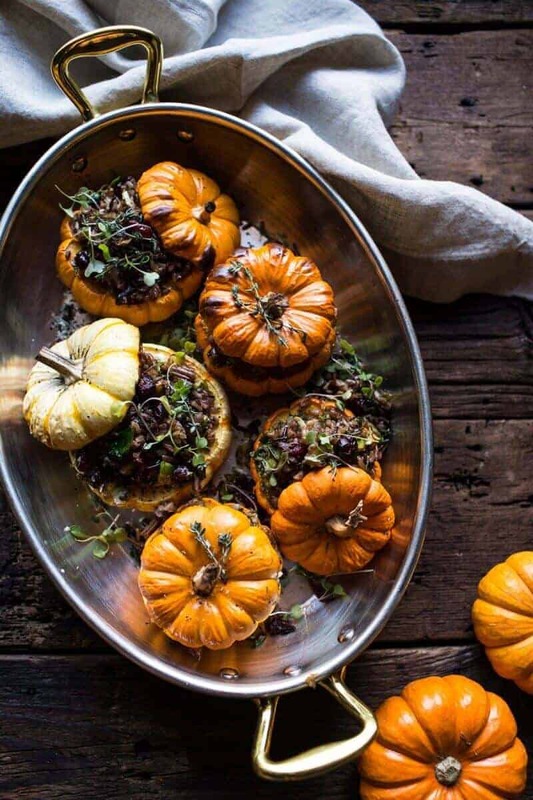 I love the idea of stuffing pumpkins, how very festive! That wild rice is killer!! Almost too cute to eat you are right but how delicious these look??? FAR OUTWEIGHS CUTENESS! Have to make these this weekend for a party side dish! It does and will! 🙂 Thank you!! Thank you, Emily! Hope you are having a good week!! These looks so good! And cute! 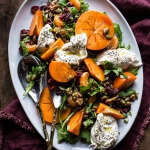 I’m sure I will make this dish, even when pumpkins at scarce. Every time you mention little Snape I’m more and more tempted to come kittynap him. 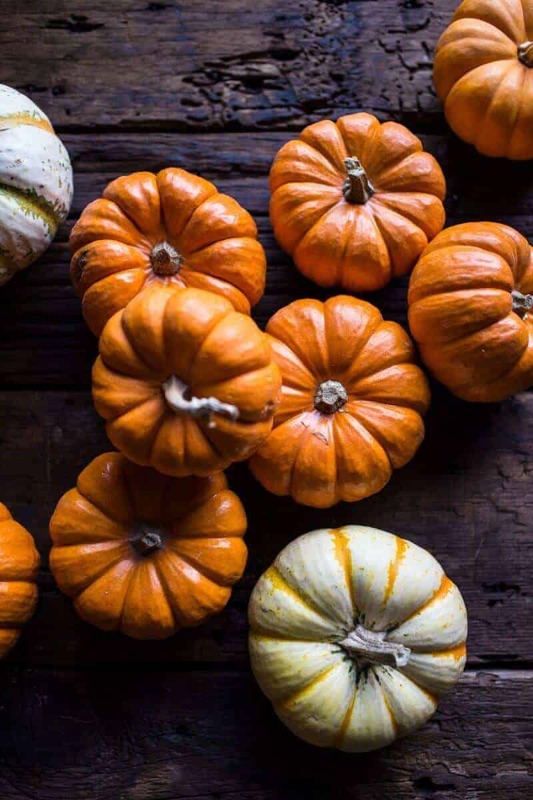 So cute, as are these delicious looking pumpkins! I’m loving that you stuffed them with wild rice. So yum, Tieghan!!!!! These are the cutest pumpkins ever, a must for Thanksgiving! I’ve got to try this! It says 1/4 cider, is that a 1/4 cup? Also I’m assuming I could cook the rice in my rice cooker and it should turn out the same? Thanks! es, it is a 1/4 cup and I would think so but I have never used a rice cooker before. Hope you love this! This looks yummy! I don’t have snap chat so put up some kitty pics! Thank you so much! I need to take some already!! 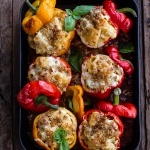 Made these (sort of) last night – I stuffed leftover chili in them. Everyone said, “so cute!” Even the farmer who runs our CSA (where I got mini pumpkins) didn’t know they were edible! Oh that sounds amazing!! Thanks Lori!! These are so cute and creative! I would have never thought to add apple cider to the rice, but I’m sure it’s delicious! I made a large stuffed pumpkin a couple years back and it specified a pie pumpkin. Is there a particular type of mini pumpkin needed for these? Thanks! Hey Anna! These are called small sugar pumpkins, they are hand held. Let me know if you have any other questions! 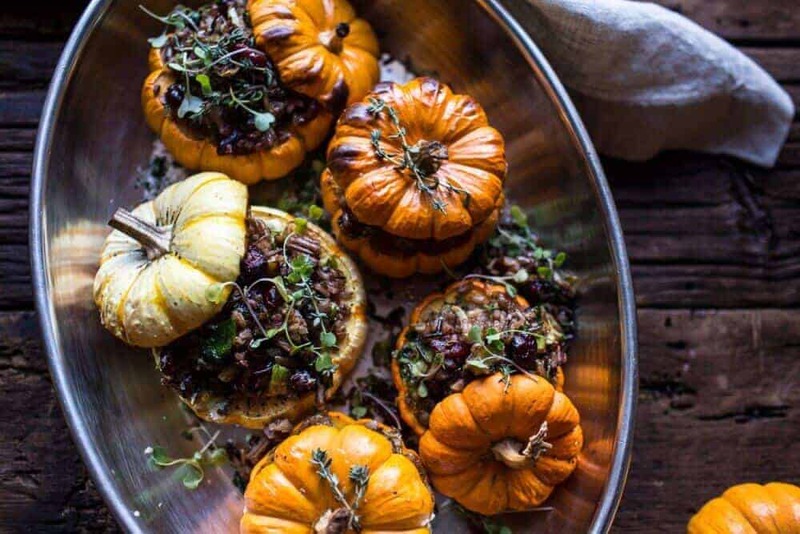 I now have my Thanksgiving menu for a group of us “plant based lifestylers.” These baby pumpkins will looks gorgeous on the table along with roasted string bean salad and my favorite Marion berry/apple crumble. A local red wine and champagne with dessert and we’re all set. Who said whole food plant based meals were boring? I plan on doing the cornbread recipe soon along with the chickpea meatloaf and roasted brussels sprouts. I bookmarked the page and sent links to three friends. Oh wow! Your thanksgiving sounds amazing! 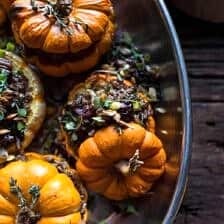 I had big plans to makes these as a Thanksgiving side, but I can’t find mini pumpkins any where. I guess i’ll just be making the rice! 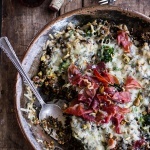 You could stuff the rice into acorn squash halves too. That would be great! Happy Thanksgiving!! I love your recipes!! I was wondering if I’m going to serve these with the tops slightly on like the pic do I need to roast them as well? If so would it be the same amount of time? Also I’ve never heard of nor can I find manchego cheese. What other cheese would you recommend? I’ve got 15 children ages 12 & under coming for Thanksgiving and I can’t wait to see their faces when they each get their own pumpkin!! I’ll be the best Nana EVER..!! The pumpkins I bought were not mini’s but medium size because it was all they had at my Giant. My problem is that they are pointed on the bottom and will tilt over. can i cut the bottom to make it flat? I made these as a vegetarian main dish for Thanksgiving. Even the carnivores loved them! The only change I made was to cut them in half the long way. Thank you for a dish that is delicious and beautiful on the table! Hi, the recipe says 1/4 apple cider. Is that 1/4 cup? FYI -The ingredient list does not show on mobile display. Hi CJ! Thank you for letting me know. I will see whats up with that! These look amazing! 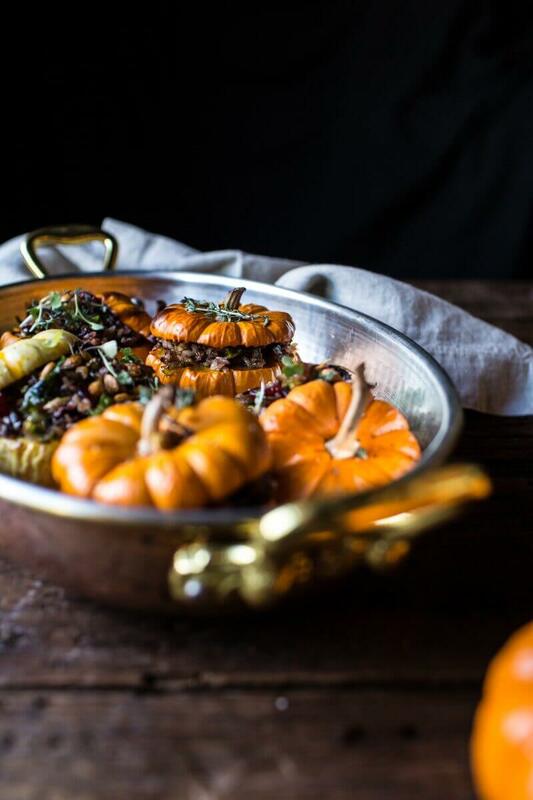 !If making ahead, would you do the first roast on the pumpkins before too, or wait until day of? Will these still taste good if I omit the pecans?